We have two different kinds of membership—individual and business. Read below to see which one is right for you! Get Textile Center library borrowing privileges. 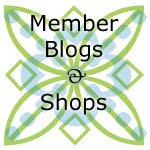 Have your blog or quilt-related Etsy shop featured on our Member Blogs/Shops page on this blog. All the benefits of an individual membership for one person, which is transferable to anyone in your business as needed. For example, you can have a different person attend each meeting. A quarterly blog post featuring your shop. For example, a description of some of your products or shop with photos, a giveaway, or a product review. You can write it or we can. The opportunity to have a table at our meetings where you can sell your products. A link, photo or button, and description of your business on our "Our Members" page. A 250 wide x 125 high pixel button in the sidebar of the blog. Buttons will be set within a gadget that rotates the buttons' position to keep readers' interest. A reasonable number of posts on our Facebook page for announcing sales or special events, around 1 per week. We would also be happy to discuss a collaboration featuring your products! You are welcome to visit one meeting for free. You can choose to join at this point, or you may attend additional meetings for a $5 visitor’s fee per meeting. Our membership dues are $40 per year. A business membership is $100 per year, and you can upgrade from an individual to a business membership at any time. Junior members age 13 and up are very welcome and have half price dues. You can join by filling out a membership form and submitting your dues online. If you would like to read more about us, you can read our bylaws.